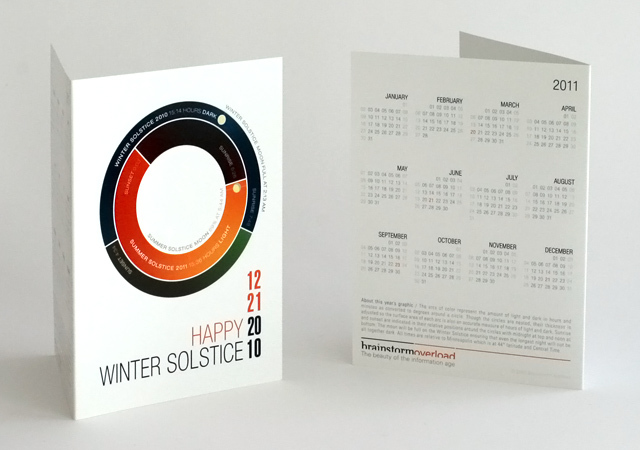 Winter Solstice Cards - BrainstormOverload - Small design studio. Big ideas. The total number of minutes of light or dark for each week in 2012 have been added together and turned into an equivalent line length. 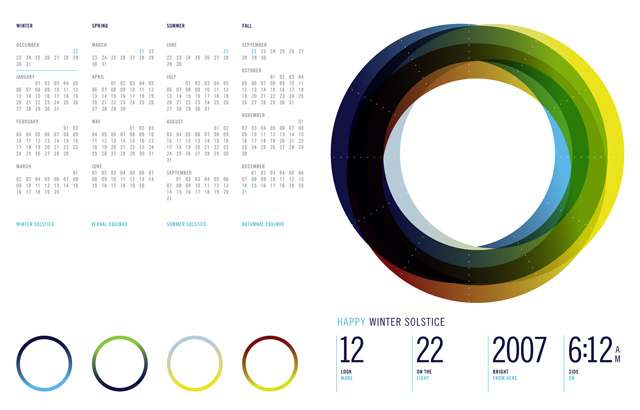 Months are colored (blues for night and warm tones for day) to evoke seasonal color shift and changes in the quality of the light. Each line is divided into segments with a full segment equal to 1000 minutes of light or dark. 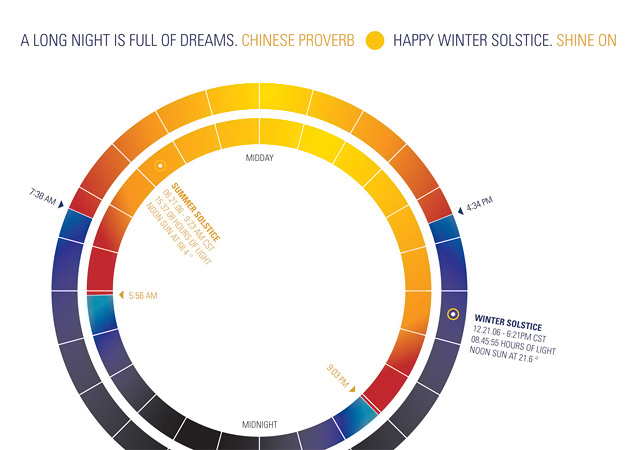 Note: If you are in the eastern time zone Winter Solstice will actually arrive on Thursday the 22nd. 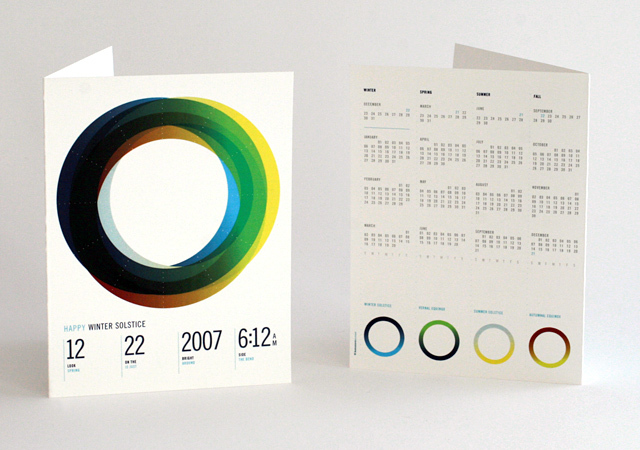 The arcs of color represent the amount of light and dark in hours and minutes as converted to degrees around a circle. Though the circles are nested, their thickness is adjusted so the surface area of each arc is also an accurate measure of hours of light and dark. 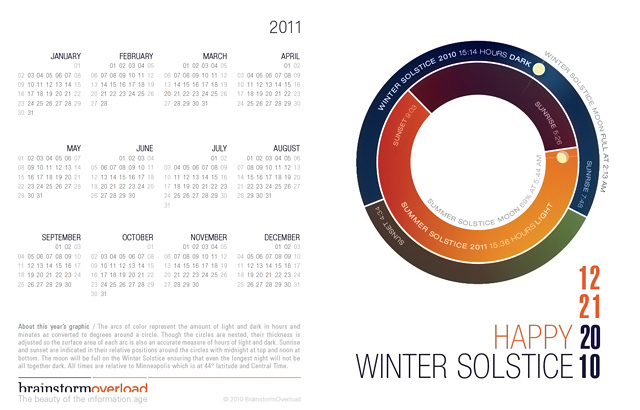 Sunrise and sunset are indicated in their relative positions around the circles with midnight at top and noon at bottom. The moon will be full on the Winter Solstice ensuring that even the longest night will not be all together dark. All times are relative to Minneapolis which is at 44° latitude and Central Time. 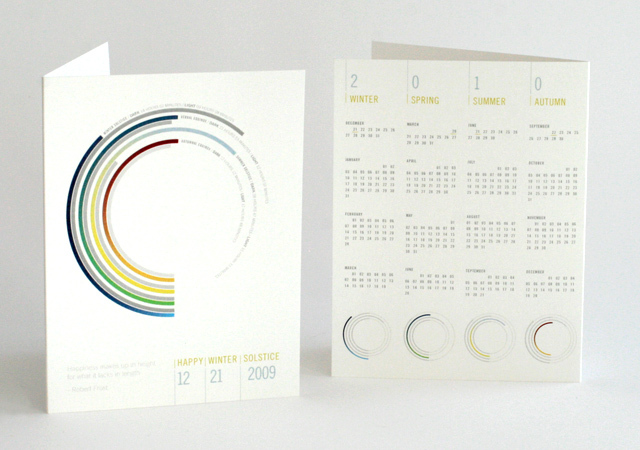 Each solstice and equinox is represented by an arc – a gray one for night and a colored one for day. The length of each arc is determined by the number of hours of light or darkness translated into degrees of circumference around a circle where 360 degrees signifies 12 hours. The 2007 is more perceptually inspired than data driven. 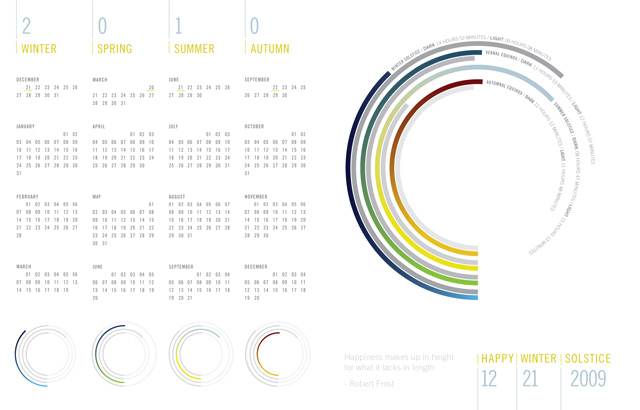 Each season is represented by a circle of color. 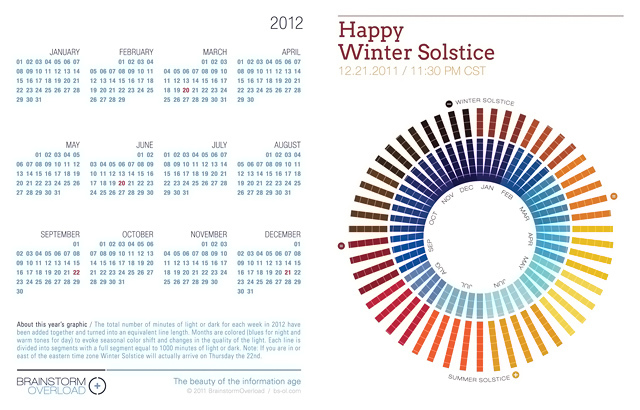 The way they overlap approximates the change in length of daylight throughout the year. 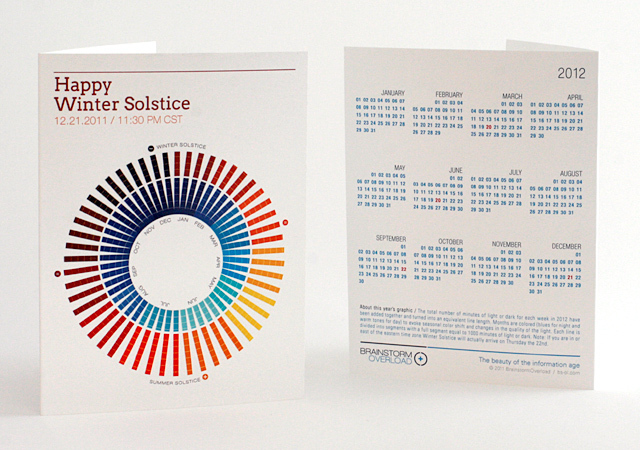 Our first Winter Solstice card focused on creating an interesting graphic that pin points the day and time of both the Winter and Summer Solstices relative to our home in Saint Paul, MN. 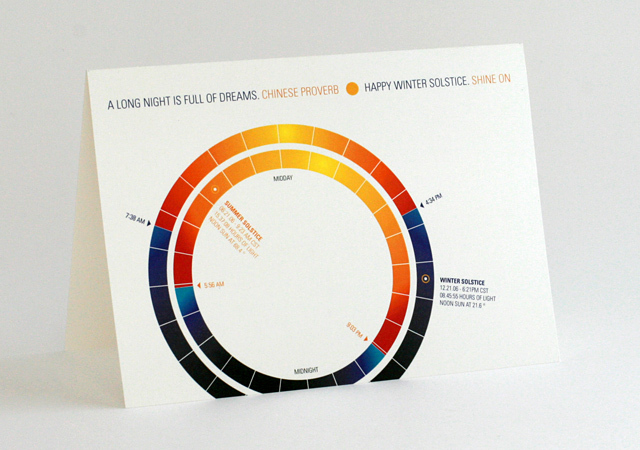 Winters are hard here so we were motivated to find a creative bright spot during the longest night of the year.